As you may know, I just got back from an unforgettable trip to the Bahamas with Royal Caribbean’s latest addition to their ever growing flock of cruise ships, Harmony Of The Seas. I never thought of myself as the kind of guy who would enjoy a cruise, I always associated it with retired couples who can’t decide where to travel, so they end up booking a cruise. Oh how I was mistaken, this ship was anything but old! From the moment you step on you are blown away by how much there is on offer, from a mechanical bar (run by robots) to a theatre where some of the best performances are carried out, to a CARTIER store (I’m sold)!!!! At 361m in length, it’s longer than both the Eiffel Tower and Burj Al Arab. 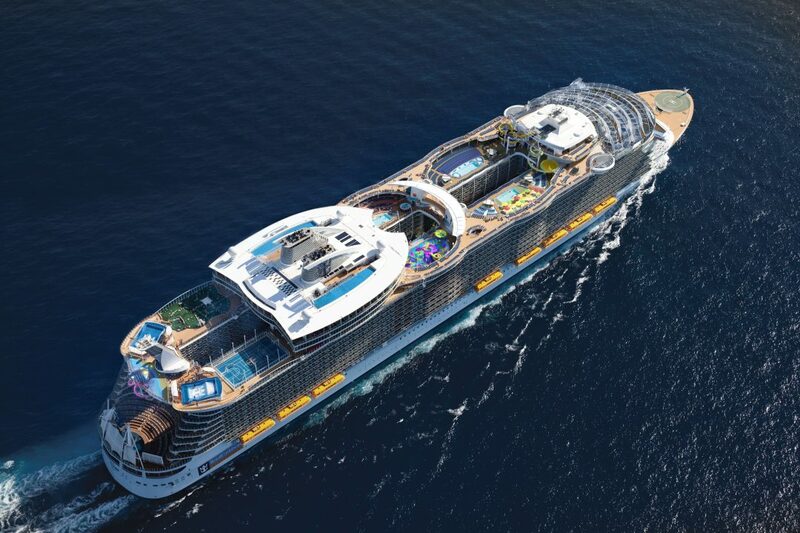 Spanning 16 decks, it weighs 227,000 gross registered tonnes and has the capacity to house 5,497 guests at double occupancy; In short, Royal Caribbean’s latest Oasis-Class ship Harmony of the Seas, is a ship of monstrous proportions; more of a floating city than a luxury cruise liner. 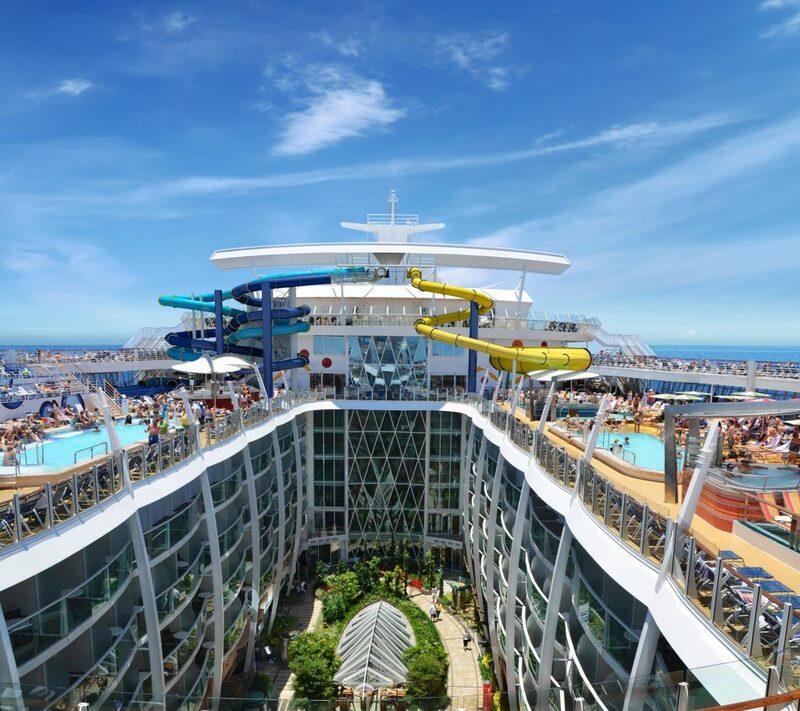 Harmony of the Seas is not only the biggest ship in the world, it’s also one of the most luxurious. This nautical marvel boasts spectacular on-board features, many being firsts-at-sea, something award-winning Royal Caribbean International is renowned for. Perhaps the most anticipated feature being The Ultimate Abyss, which at 150 feet above sea level is the tallest slide on the high seas and will challenge the nerve of even the most daring of guests. In addition, The Perfect Storm trio of water slides twist and turn over Central Park some 10 decks below and will thrill water-babies of all ages (now that’s something you don’t see every day). Keeping you high up in the air with a birds-eye view is the first zip lines at sea, where you can partake in an exhilarating ride across an open-air atrium suspended above the breathtaking neighborhood of the Boardwalk with its family friendly activities, eateries and shops. Here, the young (and the young-at-heart) can ride on the full-size carousel which has been handcrafted just for Royal Caribbean and is another fantastic first, before replenishing at one of the many cafes and restaurants found here which include international brands. The adventure, however, does not stop there, for you can try your hand at a spot of rock-climbing on two 43ft tall climbing walls which flank the open-air AquaTheater, home to a full spectrum of awe-inducing aquatic aerial displays, before perfecting your balance on the FlowRider surf simulators (something I can proudly say I mastered). If you prefer your holidays a little bit less adrenalin filled then rest assured, Harmony of the Seas offers relaxation in droves too. 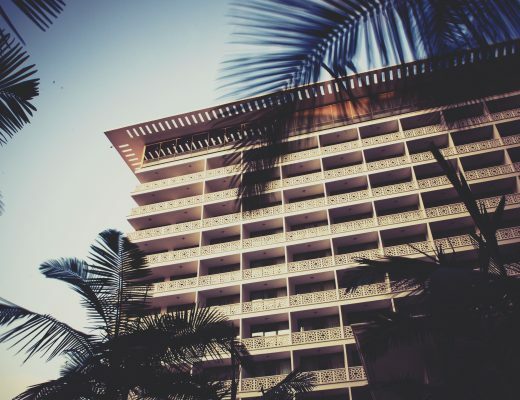 Sit back and soak up the sunshine around one of four pools or inside the adults-only solarium with its serene whirlpools. Pamper yourself at the advanced Vitality Spa with it fitness centre and extensive number of treatment rooms – the largest collection at sea. As the sun sets, the ship comes alive. Take a stroll hand-in-hand through Central Park with its bustling al fresco piazza before stopping in one of the many signature restaurants such as Chops Grille, for a bite to eat. 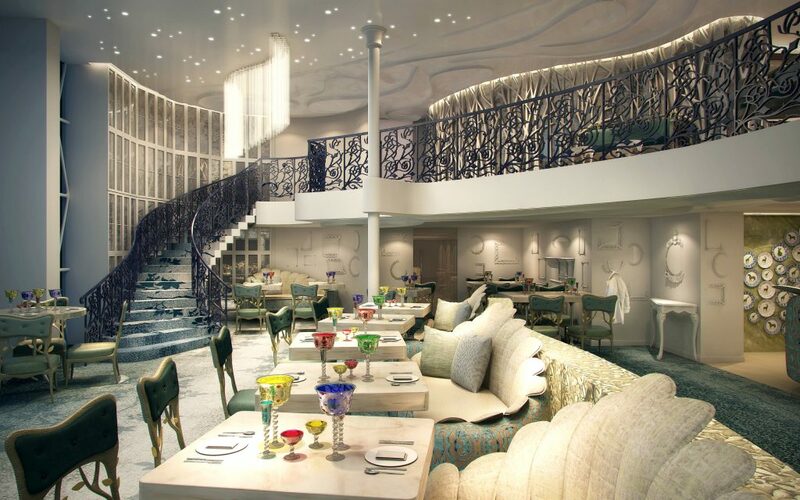 On board Royal Caribbean you can even enjoy restaurants featuring celebrity chef partnerships such as Jamie’s Italian by Jamie Oliver. 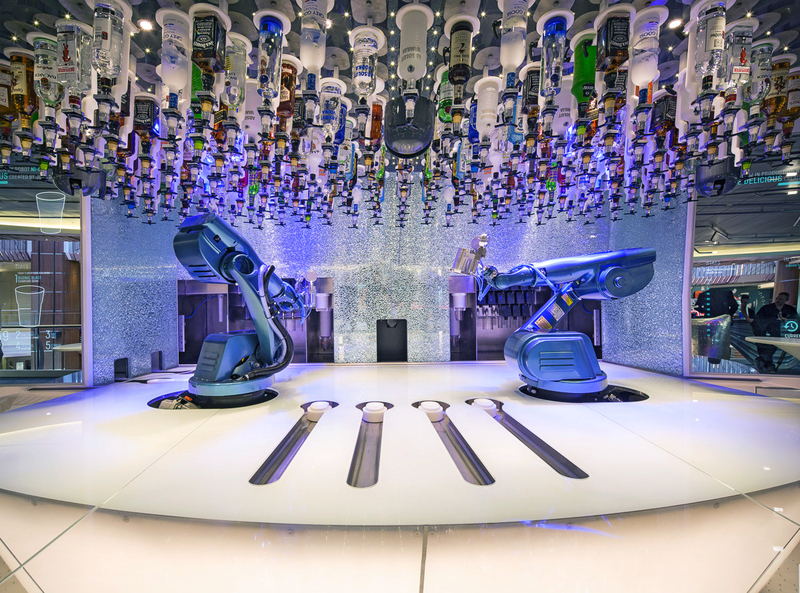 After dining, visit the futuristic Bionic Bar, a technology-forward venue complete with two robotic bartenders that shake, muddle and mix a wide variety of drinks made to order. In fact, Harmony of the Seas is the first Oasis-class ship to feature this photo-worthy outlet, so don’t forget your camera! That’s not to say that the evening ends there, for the Entertainment Place is the very beating heart of the ship after dark. Setting the stage for entertainment ensembles, Harmony of the Seas pulls back the curtain on Broadway’s hit musical Grease in the spectacular Royal Theatre. And just when you thought you’d seen it all, prepare to be dazzled by the theatrical grace of world-class skaters in one of two extraordinary ice shows. Speaking of entertainment, while we were there, we were surprised with a performance by pop band DNCE!!!!! I confidently say I had all my friends back home wishing they were on the cruise with all the snaps I posted. After the performance I was invited to a private meet and greet with the band, that definitely had to be the cherry on top of it all. Following a day of exploring the world, its exotic cuisine and interesting cultures, there is nothing better than returning to the comfort of your private stateroom. Harmony of the Seas features 2,747 beautifully appointed staterooms that offer luxurious and comfortable accommodation, many with spectacular views out towards to the sea, and with four main categories there is something for every preference. For a real taste of luxury at sea, book yourself into one of the stunning suites where guests will get to enjoy the benefits of Royal Suite Class including your very own Royal Genie, the ultimate insider, crafting exclusive one-of-a-kind experiences just for you. On board Harmony of the Seas, you’ll find everything you want from a cruise holiday and then more than you’d ever imagined possible. You’ll leave with stories to tell, adventures that have been shared and travel that has both inspired and surprised you for Royal Caribbean’s biggest ship is a destination in itself, a cruise that’s unlike anything else at sea. 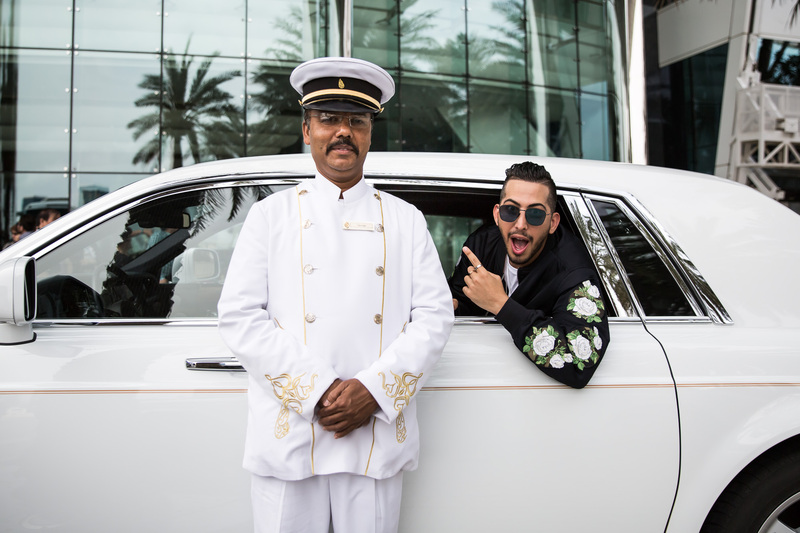 Book your next holiday on board Harmony of the Seas through Royal Caribbean Arabia by logging on to http://www.royalcaribbean-arabia.com/ or call + 971 4 331 4299 – and guess what, if you use the promocode MrMoudz, you get a discount.